The B.C. Civil Liberties Association (BCCLA) has sent a letter to the RCMP warning against “an impending, and possibly large-scale, RCMP action in relation to the Unist’ot’en camp”. The Unist’ot’en camp is a settlement that some members of the Wet’suwet’en Nation began constructing in northwestern B.C. in 2010. Its location was strategically selected to obstruct the path planned for the Pacific Trail natural gas pipeline. The settlement has since been expanded in opposition to the Northern Gateway oil pipeline, which would follow a similar route across the province. The letter goes on to present a legal argument that outlines the Wet’suwet’en’s right to occupy the area in question. The BCCLA letter, which is signed by executive director Josh Paterson, concludes by urging the RCMP to reconsider any plan it might have to move on the Unist’ot’en camp. The BCCLA’s warning follows the publication of a similar letter signed by a long list of organizations that range from environmentalists to civil-liberties advocates that’s titled, “We Stand with the Unist’ot’en”. Those include Greenpeace Canada, the Union of B.C. Indian Chiefs (UBCIC), Idle No More, and the SFU Institute for the Humanities, as well as individuals including David Suzuki, Naomi Klein, and federal Green Party leader Elizabeth May. That letter claims the Unist’ot’en camp enjoys significant support despite being relatively small in size. “We are deeply and gravely concerned to learn from a variety of sources that the RCMP appear to be on the verge of executing a highly provocative and dangerously reckless operational plan to make arrests,” it reads. The second letter was made public with a UBCIC media release. “The Indigenous Unist’ot’en Clan of the Wet’suwet’en Nation in northwestern BC are on high alert about a likely impending large scale RCMP mass arrest operation on their territory,” it reads. 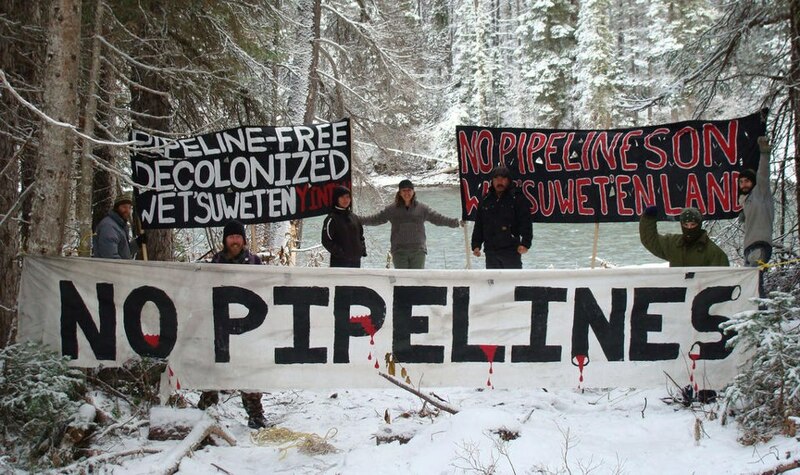 Update: According to the Smithers Interior News, TransCanada recently reported Unist’ot’en camp members to the RCMP. That followed activists blocking four TransCanada vehicles from entering Wet’suwet’en territory for the purposes of conducting “environmental fieldwork” related to the construction of a proposed natural-gas pipeline. The RCMP responded to a request for comment regarding the BCCLA’s letter with a statement that alludes to ongoing interactions between members of the extractive industry and Unist’ot’en camp residents. The RCMP’s claim that there has been no police action contradicts Wet’suwet’en people’s reports of recent increased police activity in the area around the Unist’ot’en camp. The RCMP’s statement goes on to emphasize the force remains “impartial” in the Wet’suwet’en’s dispute with corporations. Posted on August 28, 2015, in Oil & Gas and tagged anti-pipeline resistance, BC Civil Liberties Association, BCCLA, oil and gas pipelines+Indigenous resistance, Pacific Trails Pipeline, RCMP, Royal Canadian Mounted Police, Unis’tot’en, Wet'suwet'en. Bookmark the permalink. Leave a comment.